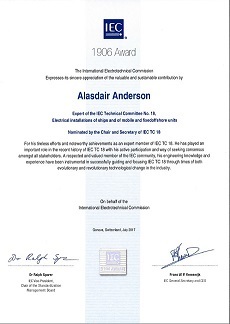 Frazer-Nash Senior Consultant, Alasdair Anderson, has been awarded the International Electrotechnical Commission's (IEC) 1906 Award. The award, which recognises the exceptional current achievements of electrotechnical experts, was presented to Alasdair at the BSI Standards Forum and Awards 2017 in London on Thursday 23 November. "We are delighted that Alasdair's expertise, hard work and commitment has been rewarded through this award from the IEC." "The IEC's 1906 Award honours electrotechnical experts around the world, showcasing exceptional and recent achievement that contributes in a significant way to advancing the work of the IEC. "Alasdair was nominated for the award by TC 18 - the technical committee for electrical installations of ships and of mobile and fixed offshore units - recognising his work within the Technical Committee over the last ten years, for nine of which he was the Chairman. "During his tenure as Chairman the TC completely updated the standards for offshore installations and started updating the existing standards for ships. New standards have been developed for High Voltage Shore Connections for ships. Work has also been started to develop standards for DC Distribution on Ships and for electrical subsea equipment to be used in oil production, as there were no standards for these new technology developments. "Even though he is no longer Chairman, Alasdair is continuing his involvement in development of the standards through his involvement in the UK National Committee feeding in to IEC and as an expert on several of the IEC TC 18 working groups." The IEC prepares and publishes International Standards for all electrical, electronic and related technologies, managing conformity assessment systems for electric and electronic products, systems and services, collectively known as electrotechnology. Almost 20,000 experts from industry, commerce, government, test and research laboratories, academia and consumer groups, participate in the IEC's standardisation work. Find out more about the IEC's 1906 award here.